A brightly coloured red and yellow heliconia with an upright flower spike held high above the leaves. 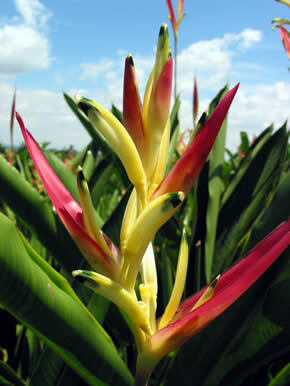 Great for the tropical look and to bring instant colour and height to your garden. Best in a semi shaded area as an understory plant - however can handle part shade to full sun (but leaves may burn). Shelter from wind and frost. While one plant is not very wide, they do eventually spread, so plant them in a place where they have room to grow, as you should dig up some members of the clump when it becomes crowded after a few years. Winter time is best to dig them up. After transplanting, water once then do not water until the surface soil is dry to the touch. It is very important that you do not keep the soil too wet. You can cut them right down to the ground every winter to tidy them up, or leave them alone.